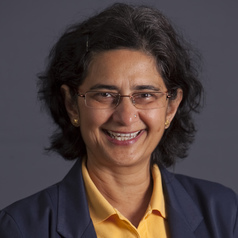 Reena Ghildyal is currently Professor in Microbiology at the University of Canberra, Australia where she heads the Respiratory Virology Group. The focus of Reena's research is molecular pathogenesis of respiratory viruses with special reference to asthma exacerbations. Current projects include the validation of respiratory syncytial virus (RSV) vaccine candidates in vitro and in vivo; elucidating the role of cytoskeleton in RSV assembly, investigating the role of rhinovirus (HRV) proteases in disease. Reena collaborates with research groups within Australia (Monash University, University of Queensland) and Internationally (University of South Florida, University of Georgia, Imperial College, Fudan University) and her research is funded by National Health and Medical Research Council, Australia-China Science Research Fund and Australia-India Science and Technology Research Fund.